News that A&E have commissioned a new series, BATES MOTEL, resurrected memories of the shocking (for all the wrong reasons) not-at-all-scary 1987 feature-length pilot which also - albeit tenuously - tried to bring the legacy of Norman Bates to the small screen. The second half of the eighties saw several attempts (with varying degrees of success) to transfer established big screen horror franchises (FREDDY'S NIGHTMARES, FRIDAY THE 13TH: THE SERIES) to television as anthology shows. BATES MOTEL was one of the first... and most misguided. The plot (such as it is) concerns Norman Bates, now deceased (Anthony Perkins was not attached to the project), leaving his motel to a fellow former nutter (Bud Cort) who decides to resurrect the business. 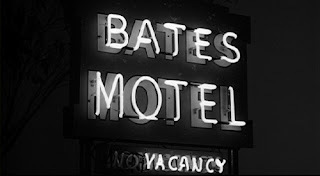 Rather than go the obvious slasher route, the show would have been a semi-anthology format centred around guests at the motel being given a supernatural second chance. 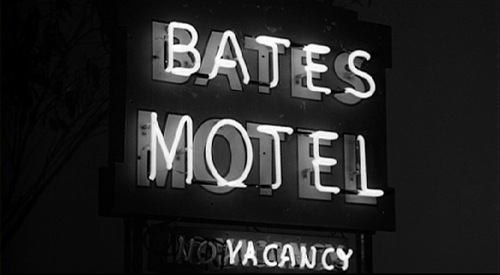 This being a PSYCHO spin-off, the producers worked-in an underwhelming stalk'n'slash plot into the pilot intended to hint that the ghost of Norman Bates himself might be thrown into the mix. It's that angle that the trailer below emphasises, even through its only part of the pilot and ends in a pure (and predictable) Scooby Doo pay-off. Perkins, who directed and starred in PSYCHO III a year earlier, was apparently critical of the project. A man with taste. The pilot was produced by Universal for NBC. The network wisely passed but did run the tele-movie in July 1987. CIC Video issued a rental-only VHS version in the UK and overseas but its been (wisely) buried throughout the DVD era. The show utilised the existing Bates Motel & house exterior standing sets on Universal's Hollywood backlot. Far more creatively successful was the cable flick PSYCHO IV which not only saw Perkins reprise the role (in what amounts to little more than a series of cameos) but also starred Henry Thomas (E.T's ex-best friend) in a series of extended flashbacks which explored Norman's twisted relationship with Mother. The weirdest thing about this trailer is that it sounds like pop-tastic Radio One DJ Simon Bates provided the voiceover!